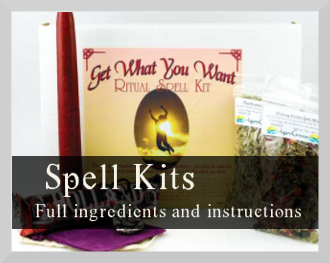 We get a lot of people asking what supplies they need when starting out with magick spells, witchcraft and Wicca. The truth is, you don’t really need anything – apart from a calm and focused mind – to practice magick. But collecting a treasure trove of Wiccan supplies can be a lot of fun, and they can also help get you in the right mood for magickal activities. So, we’ve compiled a list of all the magickal supplies that you could use for spells and rituals, along with some helpful advice on picking the right ones and using them. Click on the links below to learn more about each item! Candles are one of the most important and useful magickal tools, and have been used in spells and rituals all over the world since ancient times, and for good reason. Fire is a symbol of transformation – what could be a clearer embodiment of magick than that? 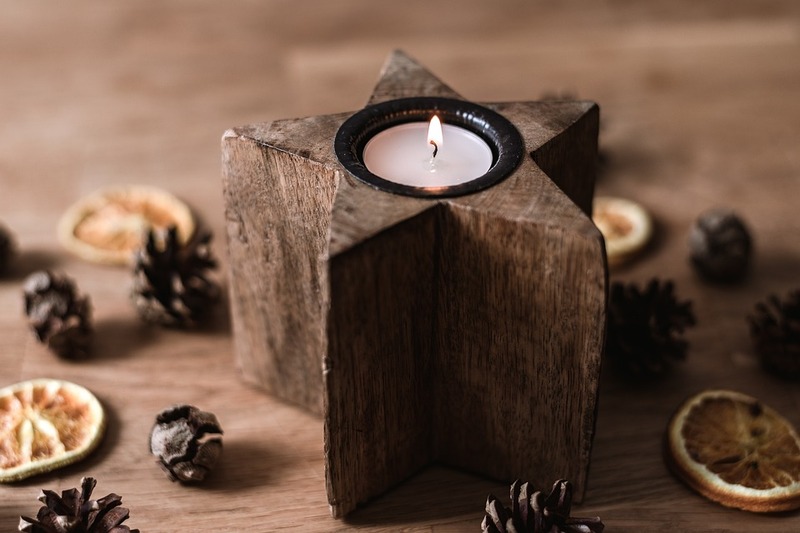 Candles also have a mesmerising effect, which is helpful for getting into a ritual mindset, and the flame can provide a focal point during visualisation or meditation. Additionally, the heat energy that they produce can be used to fuel a spell. How Many? Some Witches buy their spell candles as and when they need them. Others collect an assortment that they can choose from whenever they need to. 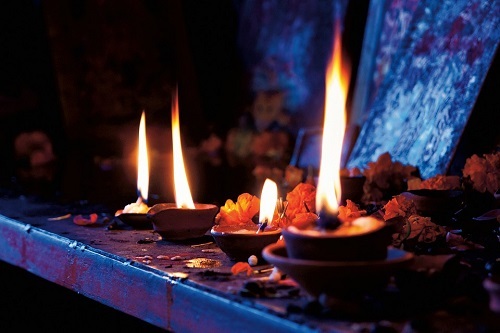 Many have dedicated candles on their altar to represent the God and Goddess, or other deities they want to honour. Bear in mind that many practitioners of magick feel that you should not re-use candles, but start with a fresh one for each spell (if you can’t do this, cleanse the candle each time). What Colours? Most spells specify the candle colours needed, and if not, it’s easy to deduce which colours are needed by reading up on candle magick colours. For altar candles, gold is traditionally used for the God, and silver for the Goddess. Fire, earth, water and air are usually represented by red, green, blue and yellow respectively. If you can’t get hold of coloured candles, white is a neutral and pure colour that can always be used. What Size? It is common to use larger pillar candles for the altar, and smaller ones for spells, since the altar candles will see more use. Then again, it depends on the spell you are performing. Most spells will specify if a larger candle is needed. Tealight candles are a good option for short spells and rituals, and some people even use birthday cake candles! Scented or Unscented? This is completely up to your personal preference. If you like the scent, and feel that it is associated with the purpose of the spell, then choose that. You can also anoint (rub) an unscented candle with an oil of your choosing. 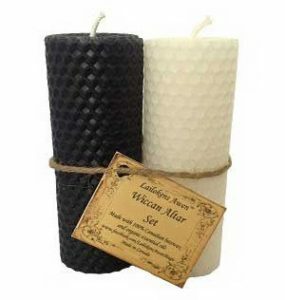 We have many types of candles in our spell supply shop. For one-spell candles, it’s common to use chime candles due to their small size. Longer rituals, which may be performed over a few days, usually require taper or votive candles. The longest-lasting candles are pillar candles, or alternatively jar candles, which are traditionally used in folk magick to send prayers and magical intent straight to the spirit world. 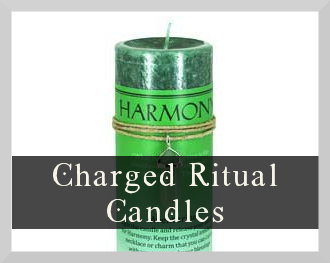 If you want to add some extra oomph to your spells, you can use ritually charged candles, which have been created and charged with a specific magickal intent. In fact, it’s not even necessary to cast a spell – many people simply light the candles while stating their intent. A spell candle works while it is burning, whether in a formal spell or not. 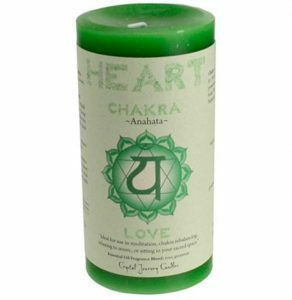 There’s a wide range available – from love spell candles to protection candles (or click here to see them all). 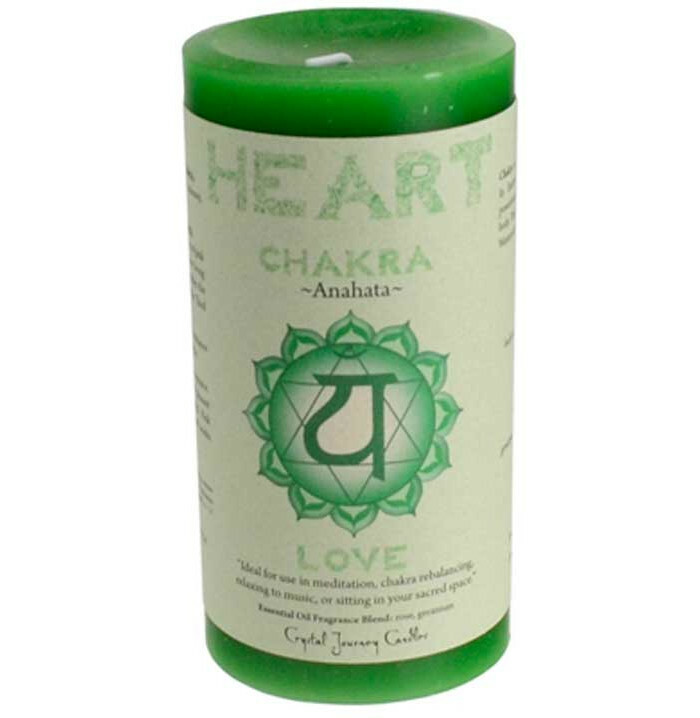 The candles are all handcrafted by spiritual artisans in the USA and Canada. We also have candle holders for candles of all shapes and sizes. Crystals are more than just beautiful rocks. Depending on the magick spell that you’re casting, they can help you carry it out from preparations to closing. 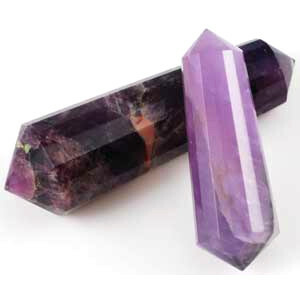 This is because crystals and gemstones can conduct magickal energy that enhances the spell. Equally, you can carry a crystal on you, or place one under your pillow for a good night’s sleep, or keep one close to your plants to enhance their growth and charge your crystal. 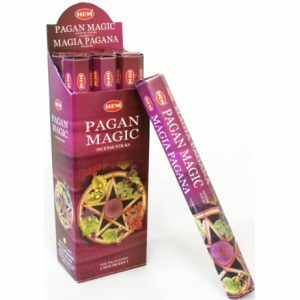 A must-have supply for most Wiccans! There are hundreds of different crystals out there, each with its own unique qualities, and you have to make sure you pick the right stone to match your intention – whether that’s for casting a particular spell, or aiding you. Before you use your crystal, make sure that you cleanse it to remove any residual energy, by burning some sage, washing your crystal in some running water or letting it sit in the moonlight for a while. Different crystals have different qualities and therefore can enhance energy differently. There’s such a wide range of crystal supplies available out there, even online at the touch of your fingertips, that it’s easy to get overwhelmed with all the choice. So when it comes to choosing what crystals you should work with, it’s a good idea to start with your intent for the spell, and then choose a crystal accordingly. To get you started, here’s a list of crystals that work well for meditation or healing purposes. Quartz and selenite are your best companions, when it comes to meditation. Quartz can help you bring some clarity to your mind, and to focus on your dreams more clearly. 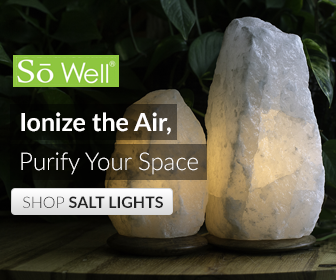 And it comes with an added bonus – quartz can enhance the energy of another crystal, so it’s good to use it in combination with another rock, like selenite. 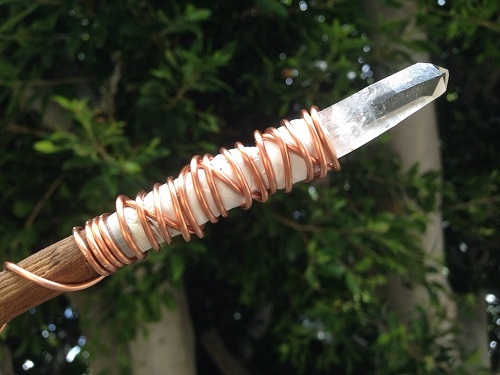 This is because selenite helps to release negative energy and any energy blockages, cleansing your body. It also helps to protect your energy field, so you can practice meditation safely. To heal your own energy and past hurts, start with agate. This stone helps to pull out stress and provide courage and strength that you need to advance on your healing path. If you’ve recently experienced a loss, wearing this stone you can help overcome the consequences of that loss. Hematite, smoky quartz and jasper can also enhance your healing spells with their grounding qualities. Hematite can help you feel physically more connected to the Earth, almost as though you are being sucked into its nurturing womb. Smoky quartz will create a slightly less intense grounding energy that will help you heal your root chakra. It does so by neutralising negative vibrations and replacing them with lighter ones. Essential oils are used in aromatherapy to get a client to relax and experience healing on a physical plane. The same applies to magick spells – certain essential oils can enhance certain magick spells. The qualities that each essential oil brings you will be similar to the qualities of the plant from which the oil was extracted. For example, tea tree, lemon oil or eucalyptus oils are known for their ability to kill germs and are often used in household chores. But these essential oils have another great quality – they also remove negative energy. To use essential oils effectively, consider getting yourself an oil lamp or an electric diffuser. There is a catch though – the essential oil supplies that you choose must be real plant-based essences. Man-made stuff just won’t create the same effect. 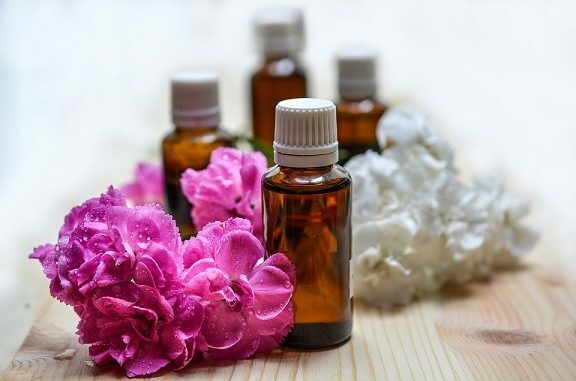 To help you choose the right essential oils for your toolbox of Wiccan supplies, consider the intent of your spells and the properties of each essential oil. For a romantic evening with your partner, or to enhance any love spells, use a few drops of patchouli essential oil. This essential lowers our defenses, making it the perfect choice for deepening a connection with a partner. Essential oils can be added to candles and used in candle magick spells. Add a few drops of lemon essential oil to the tip of a candle or smudge it all the way down, visualising how the oil removes negative energy. You can then stick some herbs, like lavender or sage, to the now sticky candle, before lighting the candle. If you’re facing some tough circumstances, struggling to make a difficult choice or trying to summon the energy to follow through with a plan, try adding some cedar, musk or rose to your spells or your witch’s altar. We have a large range of pure essential oils in our spell shop, but if you’re struggling with choice when it comes to the type of oil you want to use, you can also use a spell oil blends – a pre-made blend with the ingredients that suit the type of spell you’d like to cast. Our zodiac oils are very popular, since they can be used for several types of spells, but we also have more specific blends for abundance, love, healing, protection, good luck, and various spiritual uses. Incense sticks have become quite popular in recent years – they help set a mood in a house or diffuse any bad smells. 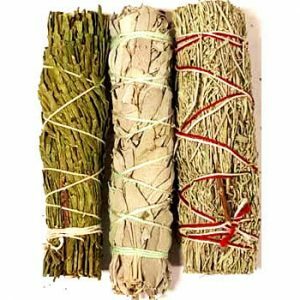 But more than just air fresheners, incense and smudge sticks have a whole array of other, more important qualities and are very versatile ritual supplies. Many cultures around the world use incense and smudge sticks in their practices – Native Americans use sage, cedar and copal smudge sticks that are seen as sacred in their culture. Taoists, Buddhists and Catholics use other types of incense sticks but the basic concept is the same – burning the incense or smudge stick helps to drive away negative energy, while making the room pleasant for the arrival of divine energy. 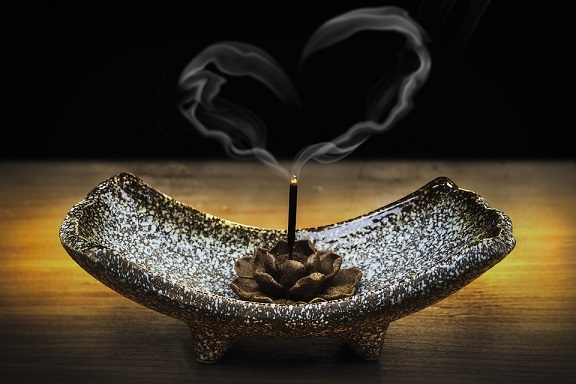 Before choosing what incense or smudge stick to use, it’s important that you have a pure intent and a clear mind, free of any egotistical desires or racing thoughts. 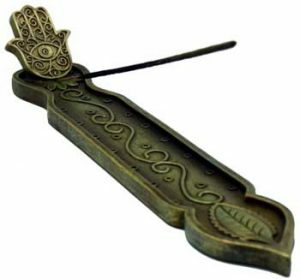 This means letting go of any notions of what’s the right or wrong way to burn an incense stick, and simply letting your intuition take the lead and guide you. To help you choose the right incense or smudge stick for your magick spells, here are some questions you should consider. What kind of spell do you wish to perform? Sage is great for clearing the air, neutralizing any negative energy and promoting a peaceful atmosphere at home. 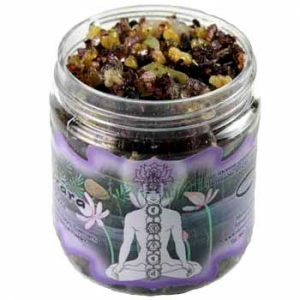 Myrrh, on the other hand, is excellent for self-love spells, calming meditation and healing. Lavender is the fragrance to choose if you wish to feel more positive, uplifted and joyful. It’s particularly useful in love, prosperity and fertility spells. What kind of atmosphere do you wish to create? As well as using incense or smudge sticks in spell-casting, you can also use them to set the right mood or to close a spell. Cinnamon is great at enhancing your psychic abilities and protection rituals. Lemongrass helps stimulate your mind, and promotes visions while helping you to remain focused. Vanilla, on the other hand, can help you tap into your inner riches, making you feel more at peace and more comfortable in your own skin. We have a wide selection of incense in our spell supply shop – not only stick incense and cone incense, but we also stock smudge sticks as well as powder and resin incense. 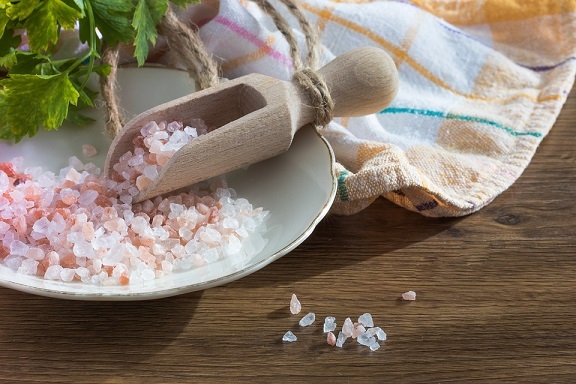 Salt has been used by almost all cultures around the globe – both for its physical antibacterial properties and for the way it can enhance psychic abilities. Salt can absorb psychic energy, thus making it an excellent aid for guarding yourself against psychic attacks. Salt can also be used to purify your surroundings and prepare for important ceremonies and rituals. For instance, you can fill a small bowl with water and add some salt to it. Then leave it in the ‘hearth of the home’ (whether that’s your kitchen or living room – whichever room you consider to be the centre of your household) to absorb all the negative energy for three days. On the third day, dispose of the contents, along with any negative energy. You can also sprinkle a pinch of salt in all four corners of a room before starting any spell work, to make sure it’s sealed and cleansed. The key to choosing the right type of salt for your magick practice is matching the intent of your magick spell with the corresponding properties of the salt. Black salt is known as the repellent of the unwanted, and great for cleansing various spaces. Some believe that it can even help you get rid of unwanted guests and protect you from those whom you’d rather avoid. You can make your own black salt – check out some simple black salt recipes here. Kosher salt is widely used in Jewish religious practices, as a way to extract blood from the meat before eating it. It has a particular flaky and coarse structure that helps extract the blood. While kosher salt does contain iodine and anti-caking agents, in terms of magickal properties, kosher salt is similar to simple table salt. Himalayan salt is harvested in Pakistan, and contains traces of iron oxide, which gives it that lovely pink shade it’s famous for. 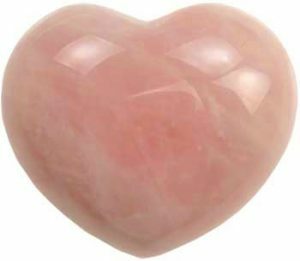 Some witches use Himalayan salt in love and self-love spells, while others induce their healing, abundance, prosperity and dream manifestation spells by using adding a sprinkle of Himalayan salt to their altar or magick tools. Herbs have been used in magick and healing practices for as long as one can remember. The ancient Mayans, for example, used different herbs in healing, believing that each herb contained a certain spirit. For them, it was the spirit and not the physical properties of the plant, that was responsible for healing a person. Pagans use herbs and plants in their practices. 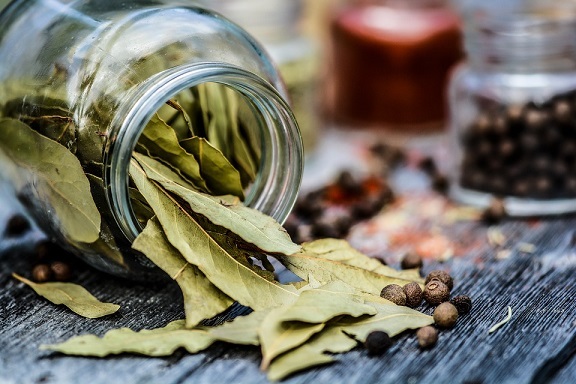 Herbs are also widely used in Wicca and witchcraft, either as dried plants, distilled in essential oils, or in powder form (as processed roots). Witches who practice hedgewitchery usually have a wide supply of different herbs. Each herb has different healing and magickal properties that are associated with it. Some of the most popular herbs as magick supplies are rosemary, thyme and lavender, each possessing their own unique properties. Rosemary is used in healing and purification rites, and can also alleviate stress, strengthen a person and help achieve mental clarity. This plant is associated with the Sun, and particularly useful for those born under the sign of Leo. Thyme is great for healing and purification spells. Additionally, thyme can help induce love and psychic awareness. Those born under the sign of Taurus or Libra can draw particular benefits from thyme, as this herb is associated with Mercury and Venus. Lavender is well-known for its relaxing qualities. Lavender pillows are often used to induce a good night’s sleep and stimulates relaxation, happiness and purification. Geminis and Virgos can draw particular benefits from this plant, as it’s associated with the planet Mercury. A book of shadows or a magickal journal is a supply that every magick practitioner should have. A book of shadows can help you access a range of spells for a variety of intentions and purposes, while a magickal journal can help you keep a track of your own unique spells, how effective they have been, and reflect on your growth as a witch or a warlock. 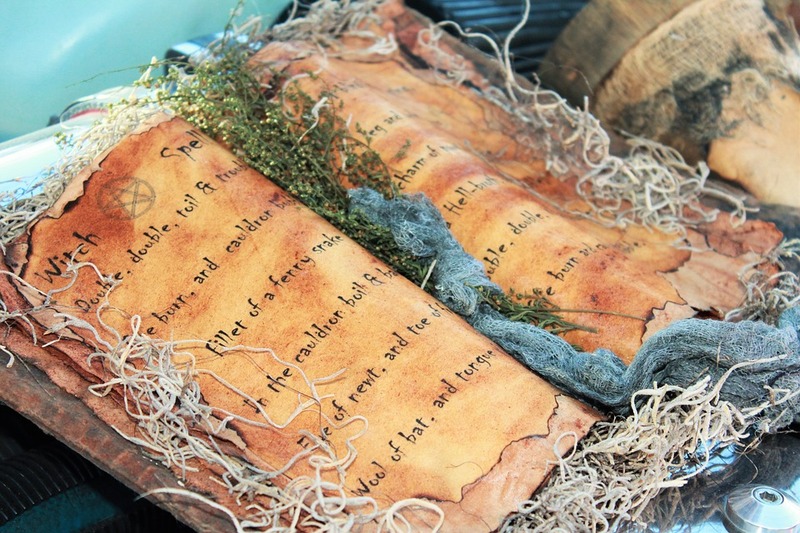 Your book of shadows or magickal journal can be a highly personal item, or it can be a traditional book that has been created by witches from a particular tradition to keep a record of their spells. Gerald Gardner is deemed as the ‘father of Wicca’. In the more traditional Gardnerian Wicca movement, each witch who has been initiated into the movement can have their own personal ‘cookbook of spells’. The witch can then copy spells from Gardner’s book, as well as add and remove any material, according to their own needs and preferences. The book is burned when the witch passes away, to keep their witchcraft a secret. There are many types of witches and ways to practice witchcraft, and some of these practices involve initiation into a witch coven. Once a witch is initiated, they gain an access to a special book of shadows that contains core rituals and practices of that particular coven. 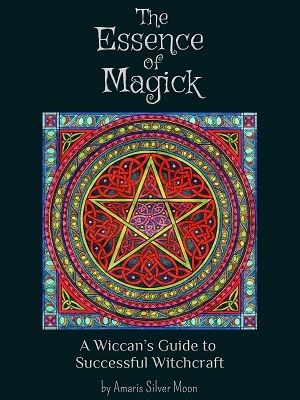 This is a highly personal item where a witch can record any spells that work for them, as well as information regarding divination, astrology and herbal practices. This magickal journal can become the witch’s sole book of shadows, or it can be an item that the witch can use alongside a coven’s book of shadows. Tarot cards get a lot of bad press from religious zealots. However, they are a divination tool that, similarly to pendulums, help the person using the tarot cards to tap into the invisible divine force all around us to get a better insight into their past, present or future events, and thus receive some guidance in making a difficult choice. Providing that the person who uses the tarot cards has a pure and loving intent, of course, and is not doing this practice for any selfish or egotistical gains. Since the future is fluid, it is impossible to use tarot cards – as well as any other form of divination – to accurately predict how a certain event will unfold. (Folks do have free will, y’know!). But tarot or oracle cards can help you get a better understanding of any potential outcomes, as well as any influences from your past or present that are interfering with your thoughts or even intuition on a particular situation. 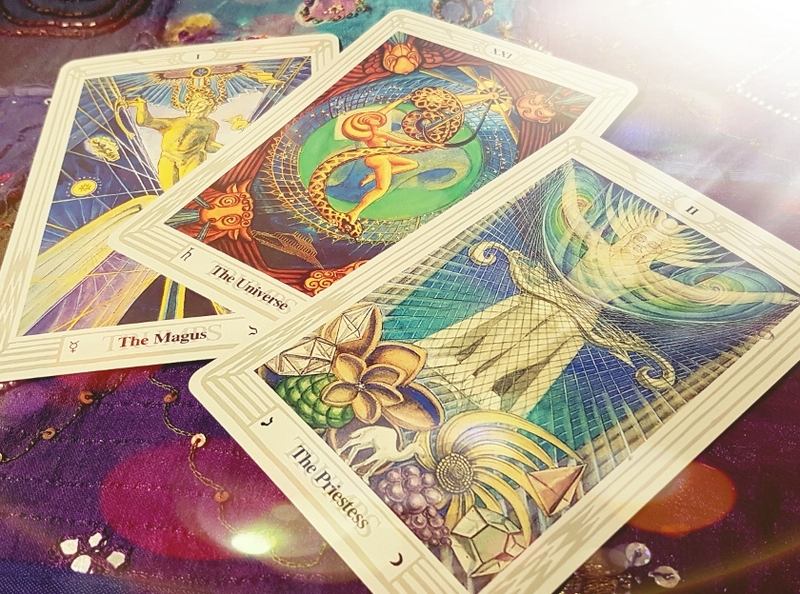 From Angel cards to Oracle divination cards, to Tarot, there is a vast supply of cards available out there, and you need to be careful in choosing the right deck for you. Here are a few points to consider. Are you purchasing your cards from a trustworthy retailer? We live in a day and age that’s ripe for elevating human consciousness to the next level. More and more people feel a sense of emptiness or a lack in their day-to-day activities of pursuing a career or success, and instinctively turn to spirituality for some answers to their existential questions. Where there is a demand, there is an opportunity for business, and so the internet has become saturated with promotions and offers from ‘spiritual gurus’. You need to be very careful and employ both the wisdom of your mind and your intuition when making a decision on what Tarot cards to purchase. Ask yourself – does this look like a trustworthy retailer? From the card descriptions, does it sound like the retailer knows the product they are trying to sell? If I look at the person selling the cards, do I feel like I can trust them? Do you have a personal and intuitive connection with the card deck? This is an important one – when you hold the deck in your hands or see an advert online, does it feel like this deck was made for you? Online adverts will try and convince you that any deck you’ve clicked on is perfect for you, but do you feel that intuitive connection? It’s easy to get carried away on a wave of euphoria when doing your research and getting excited about using your Tarot card deck. Try to zone out of those feelings and instead listen out for that soft and yet all-knowing voice that tells you whether this is the right deck for you. Pendulums are widely used by witches and Wiccans around the globe, and there’s a vast array of literature surrounding the use of pendulums. The most basic explanation of a pendulum is that it’s a divination tool that you can connect with and programme, to tap into the divine source that is all-knowing, and find some answers to questions that bug you. Before you use your pendulum though, you need to observe certain rituals in order to programme your pendulum. This will help you recognize when it says ‘yes’, ‘no’ or ‘I don’t know’. While pendulums can be great supplies for locating your missing keys or deciding what route you should take to avoid the traffic today, they don’t know everything. 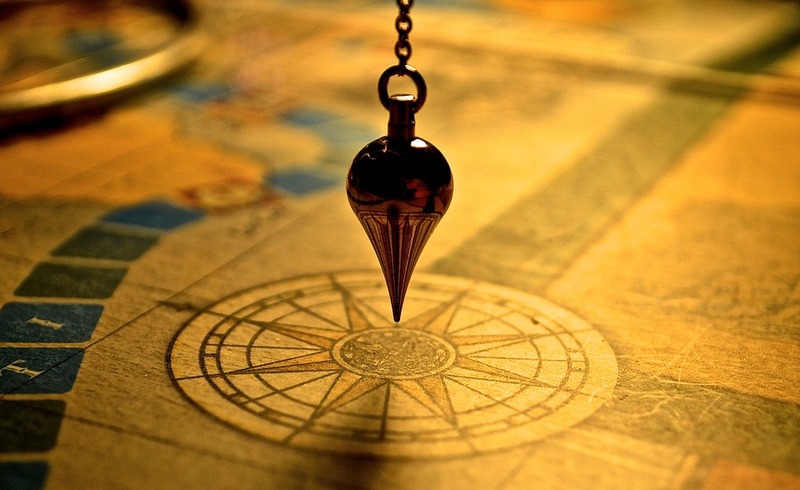 Also, remember to be in a calm state of mind before using a pendulum – using one when you’re in a crisis and desperate for answers, can result in the wrong type of attention (instead of tapping into the divine mind, you may accidentally connect with an equally unsettled spirit). Physically, a pendulum is a small weight tied to a piece of string or a chain. 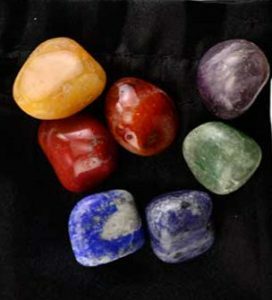 Traditionally, crystals or amulets are used as the weights. Your pendulum can be as elaborate or simple as you want it to be. While you don’t necessarily need a crystal to create a functioning pendulum, they can be helpful tools that enhance the divine energy streaming through your pendulum. Red crystals enhance love and passion, while black crystals have a protective energy about them. The most important thing is to choose a crystal that really appeals to you and your intuition. What’s the average length and weight of a pendulum? There’s no rule surrounding the length of a pendulum, but most witches choose a pendulum that’s fairly small and can easily fit inside a pocket and thus be highly portable. The weight of your object (crystal, amulet or other) is usually somewhere around 1/2 inches by 1 inch. The chain or the string tends to be about 8 inches in size. In the ‘olden days’ runes were used to inscribe letters that helped in creating an alphabet. Runes were inscribed on standing stones, scabbards, arm rings, amulets, knives and special rune stones, among other objects. In modern magick practices, witches use runes to inscribe magickal names or powerful words on a number of materials. Runes can then be used individually during a spell or combined together as a Rune Set, or used in conjunction with other items, for an enhanced effect. Quite often a witch will carve a specific rune into a wooden object, and then burn the object after the spell has been cast, to release the power of the rune and the spell itself. There are many Rune Sets available but the most popular ones to this day are the Elder Futhark, the Younger Futhark and the Anglo-Saxon Futhorc. The Elder Futhark Runes Set in particular is often used in modern magick practices. 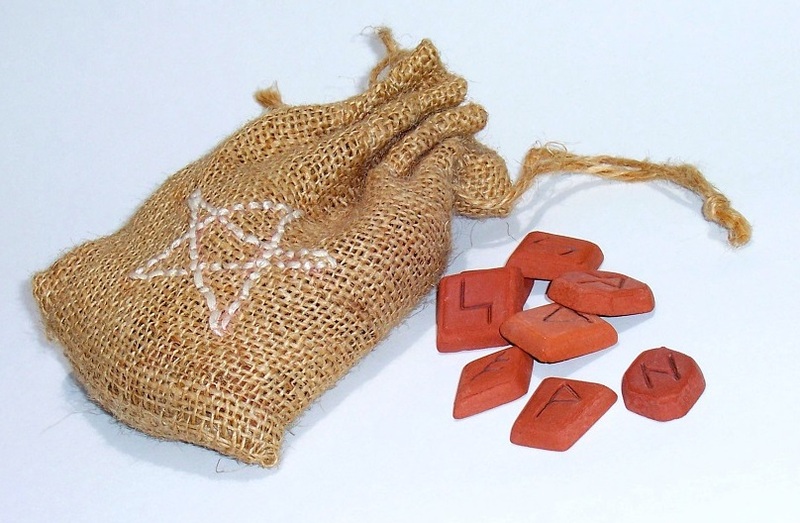 Rune sets are available in many materials – for example wood, clay, stone and resin. Once you have your Rune Set, you can then decide on the best way to apply it to your spell work. You can either write, carve, paint or even cast your runes into jewellery. Runes can be a powerful aid when doing candle magick, if you inscribe a specific rune into a candle to gain access to its power. Scrying is an ancient art, used by mediums and oracles across the globe, to get a message or a vision about the future, by looking at a scrying device. Various scrying devices have been used for centuries to detect prophecies, foretell fortune, gain inspiration and perform divination. In its most basic form, scrying follows this pattern – the ‘scryer’ will perform meditation or chant mantras to remove any unfocused thoughts from their mind, before entering a trance or a state of self-hypnosis where they become susceptible to visions and prophecies. There are a number of scrying supplies available out there. The most traditional scrying device that we often see depicted in films or children’s books is a crystal ball that foretells the future. However, scrying can also be performed on a bowl of water (this is what Nostradamus used), coffee grounds, scrying mirrors or crystals, among other things. When choosing the right scrying device, you need to find one that works best for you. However, remember that the important thing is that you’re tapping into your ‘sixth sense’ and achieving the right kind of trance-like state, not so much the scrying device that you’re using. Traditionally, an altar was used as a holy place where sacrifices were performed. In ancient cultures, these sacrifices often involved bloodshed and therefore an altar may stir some negative associations in your mind. However, an altar can become your own sacred space, where your spirit can anchor itself during meditation or spellwork. In other words, your altar can be your focal point where you go to pray, meditate and perform spells to clear your aura and relax. 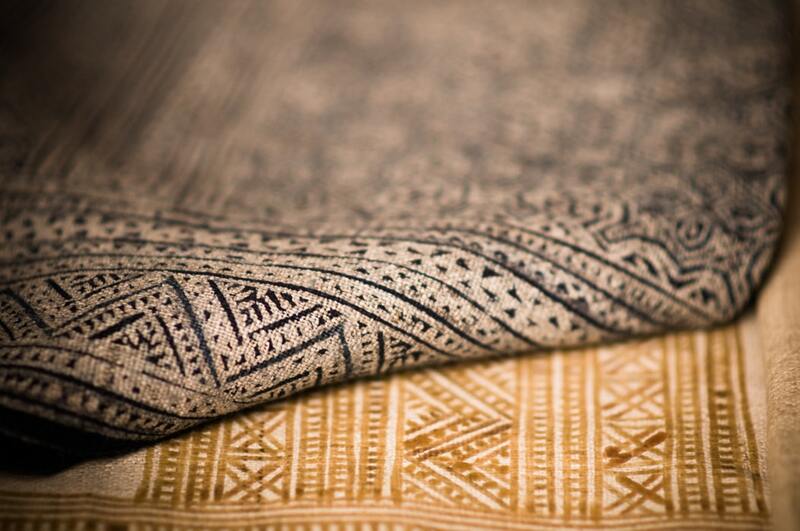 An altar cloth can help you create boundaries around your altar. The cloth also symbolises holiness and respect towards the altar. On the practical plane, an altar cloth can simply help protect the surface of your altar, especially if it is made of wood, or add a little beauty to the composition of your altar. Altar cloths are supplied in all shapes and sizes, and can be as elaborate or simple as you want them to be. The Catholic Church will often use finely embroidered cloths, adorned with gold or silver thread. The Eastern Church traditionally uses a selection of altar cloths in a ceremony. A plain linen cover called The Strachítsa covers the Holy Table, attached to the altar with cords, and is never removed. An ornamented cover called The Inditia is then placed on top, in a colour that matches the liturgical season. A third covering made of the same material is then placed on top of that, smaller and square. While these examples are specific to certain church denominations, the bottom line is that you can design your own altar cloth, or you can lay a simple linen or silk scarf over your altar. Remember that your altar is your own personal sanctuary, and therefore your altar cloth needs to appeal to you. Altar tiles or Pentacles serve to represent your faith. You can place an altar tile on your altar, to have a visual symbol of your personal sacred space. When used in spellwork, altar tiles can hold certain energies within them. Some practitioners use altar tiles to trap certain spirits, but only use this method if you’ve received sufficient training from someone who has practiced witchcraft for a long time. A Pentacle is often used in Wicca, as a focal point to hold items that are about to be ritually charged or consecrated. There are a number of beautiful altar tiles and Pentacles available out there, made of various materials, including wood, metal, ceramic and others. When it comes to choosing the one that’s right for your altar, think about the composition of your altar – you could use your altar tile or Pentacle to represent an element that you haven’t represented yet with your other ritual supplies. 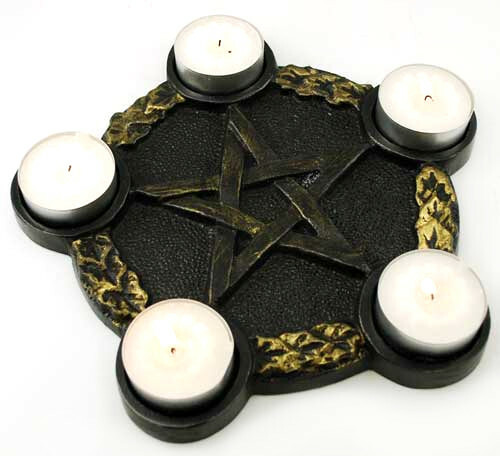 You may also find that making your own altar tile or Pentacle works better for you, creating a more personal bond between you and your altar piece. In its most basic form, a chalice is a footed cup that’s intended to hold a drink. It’s been widely used in a number of religions and cultures across the globe, especially during important rituals and ceremonies. The legend of the Holy Grail that has inspired so many books and movies, is a legend about the chalice that Jesus drank during his Last Supper. In Wicca, a chalice represents the divine feminine aspect of our Universe. It is often used in combination with a black-handled ceremonial knife, called the Athame, which represents the male energy. The chalice and the Athame combined symbolise Universal creativity and are used during the Great Rite. 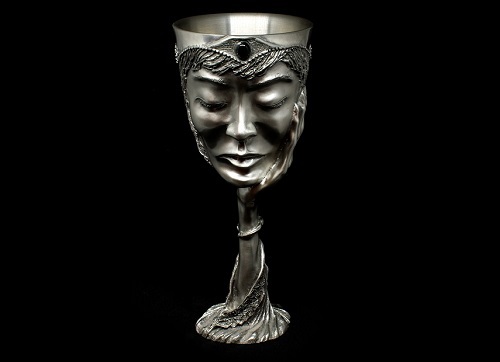 In Neo-paganism, a chalice can contain various liquids, including wine, whiskey and water. Although chalices and goblets have been used in magickal practices for centuries, what really matters is figuring out what the chalice represents to you or consider what you’ll be using it for. Consider what you’ll be using your chalice for. If you are using your chalice to represent the element of water on your altar, then it makes sense to have a chalice in a bluish colour. However, if you’re going to be using your chalice to receive blessings from the goddess Brigid, you may want to opt for a more earthly, bronze or fiery shade. If you want to represent the fire of life and the womb of reincarnation, then you may wish to consider different colours altogether. Chalices range from dainty glass beakers to heavily laden jewelled goblets. Of course, your budget will form part of your choice, but even with a smaller budget there is still a range of supplies available to you. Consider other practical matters, too – if you have small children or pets who tend to knock things over, then a small and delicate chalice may not be the best option for you. Traditional cauldrons were made of cast iron, rested on three legs and used in cooking over an open fire. While it’s no longer in use in modern cooking, cauldron is still an important element when it comes to Wicca and witchcraft magick practices. Symbolising the Goddess and rebirth, a cauldron can be placed in a sacred circle during magick rituals, as a container for burning ritual items (such as spells written on a paper, sage or smudge sticks, or melting wax). A cauldron can also be used as a container to hold ingredients needed for spell work in one place, to make potions and ‘witches brew’ and perform various germination and transformation processes. Before you start using your cauldron though, make sure to strip any magickal residue and psychic energy away from it and then coat your cauldron. Head over to the Sacred Hands Coven for full instructions. There’s such a range of cauldrons available out there that it’s easy to get confused by all the choice. While cast iron is the traditional material for a cauldron, it is often expensive. For witches on budget, there’s a whole range of ceramic cauldrons and ‘mini cauldrons’ or pillar candle holders on supply. Before choosing the right cauldron for you, consider what you’ll be using it for. While a cast iron cauldron may be more expensive, it will last a lifetime, so it may be your best bet if you’re planning on doing lots of spell-work that involves burning and heating a mixture in your cauldron. 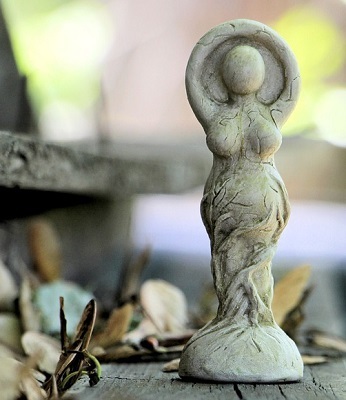 God and Goddess Statues are not essential in witchcraft and Wicca practices, however they can help enhance your altar. The God represents the male aspect of our Universe, while a Goddess represents the female. Having both would therefore help balance out these energies on your altar and in your spellwork. A common altar setup is where the elements representing the feminine energies (including the statue of a Goddess) and the elements of Earth and Water are placed on the left side, while any elements representing the masculine energies (the statue of God) and the elements of Air and Fire are placed on the right side. There are hundreds, if not thousands, of God and Goddess representations in various religions and cultures. This is because most religions and cultures recognize the dual nature of the world – to have a good balance, both masculine and feminine energies are required. Traditionally, various Sun deities represent God while Moon deities represent the Goddess. For example, the ancient Inka culture had a god called Inti to represent the Sun, who was the supreme God and took the shape of a male. In the same culture, Mama Quilla was known as the Moon Mother and Inti’s wife. There are a great number of God and Goddess statue supplies available online, and you can even make your own (although if you want a sturdy bronze or iron statue, it’s best to get one online). It’s probably a good idea to choose a statue of a God or Goddess that you’re familiar with (i.e. one that you instinctively pray to or have been brought up with). You can also have several statues with various deities who represent different aspects of the collective human psyche. This way, you can call upon a specific God or Goddess to help you achieve your desire (for example, calling upon the Hindu goddess Kali if you feel like you need to cut ties with some toxic relationships or addictions in your life). An important part of any altar or any devotional practice is making an offering to a deity of your own choosing – or the Universe at large. While you don’t always need an offering bowl to express your gratitude or to make an offering, having the bowl can help enhance your ritual and solidify it, helping you to incorporate magickal practices into your practical day-to-day life. Once you have an offering bowl, you can place herbs, liquids, powders, coins, crystals, poems or any other magickal supplies inside of it – anything that you deem to be a worthy offering to your God or Goddess. Traditionally, offering bowls are placed on the altar after you’ve said a prayer to a God or Goddess of your choosing. The most important aspect of an offering bowl is the actual offering that you place inside of it, so don’t get too side-tracked by spending ages choosing the right bowl. 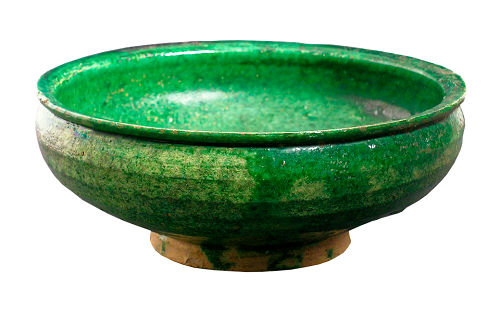 However, having an offering bowl that matches the design of the rest of your altar will bring a sense of calm and harmony to your altar and your inner sacred space. 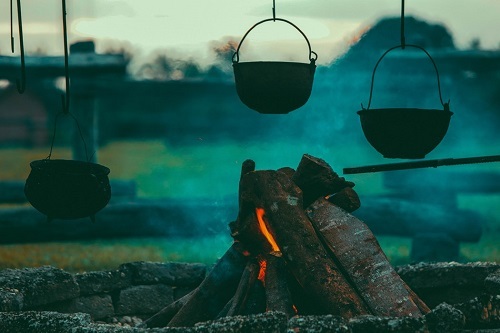 If you plan to make burnt offerings, such as written notes, incense sticks or runes inscribed on wood, it may be a good idea to choose a heatproof offering bowl (but you can also use a cauldron for this purpose). When you think of an altar bell, you may be picturing those large bells at the top of a church tower that signal the beginning of a Sunday service. However, altar bells are also widely used in Wicca and witchcraft. The altar bell serves a similar purpose to the church bells – it signals the beginning of worship, spellwork or divination. It also helps to cleanse any negative energy with its sound vibrations. Meditation and mindfulness practitioners, for example, use a small bell to create boundaries around their practice, signalling the beginning and the end of a session, while Tibetan singing bowls are used in certain kinds of meditation to clear energy. As well as considering the look and feel of an altar bell, it’s important to consider the way it sounds. A bell with an appealing tone can call healing energy toward you or invoke the divine entities to help you. 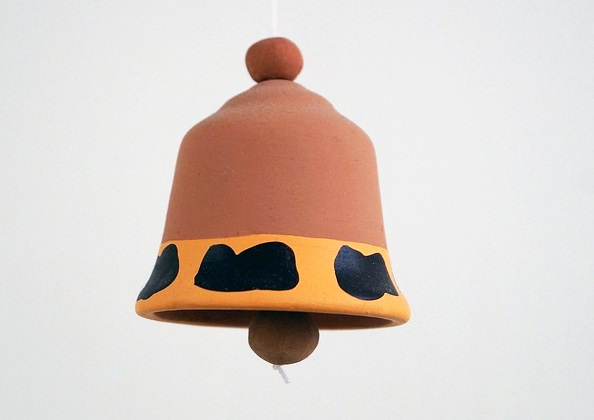 A bell can also help dispel negative energies that crop up during your ritual. Since the bell is traditionally a feminine symbol of the Great Goddess, you can choose one that’s specifically designed to invoke the Goddess. Not all Wiccans will use an altar bell, but those who do will often place the bell on the left side of their altar, since it corresponds with the feminine element of water. Therefore, you may consider harmonising the colour of the bell with the hues of water and femininity (for example, silver is a good choice). Traditionally, a wand is an essential item of any witch’s supply toolbox. More than just a decorative element of a witch’s altar, a wand can help channel and direct energy. The wand is associated with fire, and is therefore a masculine symbol. In magickal practices, it can help focus and direct your energy and your will toward a specific purpose or intention. Wands can also help cast a sacred circle of protection during ritual, as well as direct healing power toward a specific target or direction. Wands come in all shapes and sizes, and it’s important to choose one that fits well in your hand and feels like an extension of you. Choosing the right size: According to Exemplore, some traditional magick practitioners adhere to the rule that a wand should measure ‘from the crook of the elbow to the tip of the middle finger, and then just an inch or two beyond.’ What does this mean in practice? That wands for traditional Wiccans range from over a foot to about 18 inches long. Choosing the right material: Wands are traditionally made of wood, although ivory, metal and crystal materials are also used by some Wiccans. When it comes to wands made of wood, it’s important to note some features of the different trees. For example, the oak is associated with strength and being invincible, while ash trees invoke protection. Willow symbolises femininity and intuition, whereas a birch brings about purification. Making your own wand: For such a highly personal item as a wand, it makes sense for a witch to consider making one for herself. You may wish to think about this process deeply, or simply pick a twig that appeals to you. You may also consider the different qualities of each type of tree, and what you need in your life right now (i.e healing, protection, fertility, power among other things). You may wish to paint your wand, adorn it with gemstones or crystals or wrap your wand in copper wire, so that it conducts energy better. Along with a Pentacle, a wand and a chalice, an Athame is one of the most important magickal tools in traditional Wicca, Neopaganism and witchcraft. Gerald Gardner, the father of Wicca, wrote that an Athame is the most important magickal tool for a witch. An Athame is a steel double-edged ceremonial dagger with a sharp point and a black handle, and represents the element of Fire. The handle is often inscribed with important symbols, and can include astrological glyphs, runes or symbols that invoke deities and the four elements. The Athame is used in magick rituals, as it helps to direct energy. The knife is also used in casting ritual circles, carving or sealing a ‘door’ within a ritual circle, charging and consecrating different objects. It’s also the perfect tool to banish any negativity that may be lingering around. It is best used in conjunction with a chalice as together these two objects represent the masculine and feminine energies. An Athame is not usually used for cutting – if a ritual does require cutting some herbs, cords or perhaps a candle, then a different tool is used (i.e. a Boline or a white-handled ritual knife). This rule, however, can differ for kitchen witches who actively use magickal tools in everyday life to become more accustomed to using them. An Athame can either be handmade, purchased or handed down from another person to you. While touching another person’s Athame violate personal space, it’s perfectly fine to use an Athame that’s been used by another witch before you, so long as you observe certain rituals of consecration. If buying an Athame, there’s a belief that you should never haggle over it’s price and just accept the price that’s given to you. While Athames are supplied in all shapes and sizes, the size is not really that important. So long as an Athame fits comfortably in your hand, you’re good to go. However, Athames do come in a range of materials, and here some consideration can really pay off. An iron or steel Athame with a wooden handle is the most traditional combination. It’s a good idea to buy a knife with a blade that’s forged in one piece, rather than glued or welded together. This will reduce breakage and help you to conduct energy more smoothly. The perfect Athame will have a blade that extends the whole way through to the handle, or at least a great chunk of the handle. 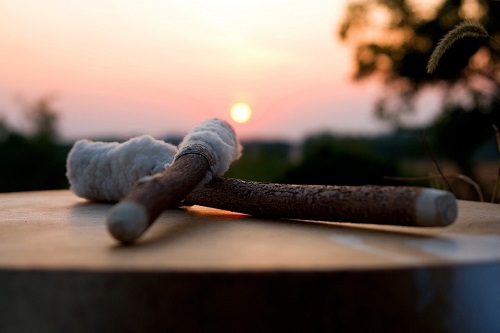 Musical instruments are particularly important in shamanism – a type of witchcraft where the ‘shaman’ enters a trancelike state to receive visions or to communicate with spirits from the Otherworld. But it’s not all about Shamanism – musical instruments are ritual supplies also used in other types of Wicca and neo-pagan traditions. The good news is this – it’s fun to do and you don’t have to have a degree in music to incorporate musical instruments in your own magickal practice! As well as enhancing celebrations and ceremonies, musical instruments can greatly enhance your rituals and the magickal properties of other objects on your altar. There’s a range of musical instruments out there that are associated with magick. Since an important aspect of Wicca is the knowledge and use of different elements, it’s important to note how different musical instruments can evoke different elements during a ritual. When the Earth is represented in music, it’s usually through the kind of instruments that create a sense of grounding. These are usually the drums, rattles, rhythm sticks and tambourines. 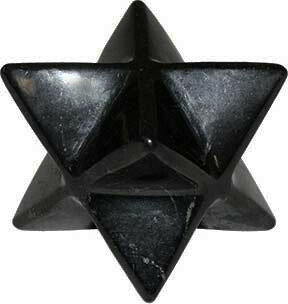 These are great to use in conjunction with Earth magick rituals and spells related to money, prosperity and fertility. Drums are also great for trancework. Water is evoked with percussive instruments that give a sense of resonance, such as gongs, bells, cymbals and sistrums. These instruments are great for enhancing healing, friendship, compassion and spiritual love spells. Try hosting a ‘water rite’ on a beach with these great-sounding instruments! Unsurprisingly, the element of Air can be evoked by musical instruments from the woodwind family. These include reed or wood flutes, recorders, panpipes and oboes, among others. These are great to use in conjunction with Air magick spells that increase mental powers, visualization and psychic abilities. Think of someone serenading under the window of their lady love to evoke that flame of passion. What do they usually play? A guitar. That’s right – string instruments are perfect at lighting that wild fire within you, so if you’re casting some fire magick spells, try combining them with playing a harp, lyre, guitar or violin. Fire magick spells are great for giving you courage, spurring on chance and the willpower to carry out your ambitions. 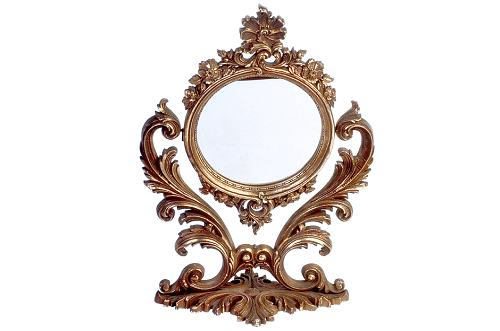 Magick mirrors have been used in divination practices for centuries – in the West, magick mirrors were particularly popular from the Middle Ages to the nineteenth century. In its most simple form, a mirror reflects everything about you – starting from the things that make you feel good about yourself, to the things that don’t. These are usually the areas where healing is needed. So one way you can use your mirror is by sitting down and gazing in the eyes of your own reflection for at least ten minutes, and noting what images, thoughts and feelings come up. Emotions may rise up, and that’s ok – encourage them to surface and embrace them, even if they feel upsetting at the time. This type of meditation is excellent for achieving a sense of wholeness and completion within yourself, as you are integrating, rather than just running from, your feelings. 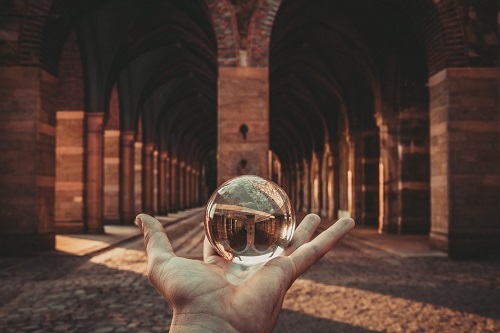 Remember that mirrors are very powerful tools – they can become your portal into another realm, they can help you perform divination and they can reflect any spells back to the sender. However, be cautious when exercising the latter as this may harm the other person, and you don’t want to do that. 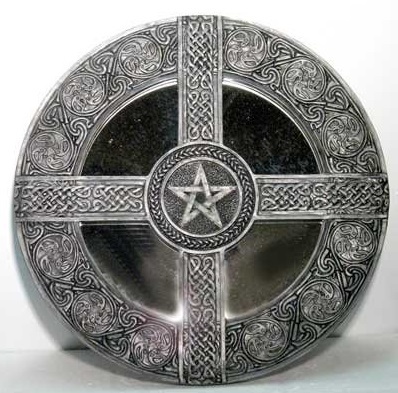 If you wish to enhance your Wicca practice with some magick mirrors, you can choose any mirror that comfortably rests in your hand or is small enough to fit on your altar. Your mirror can be as simple or as elaborate as you want it to be. To make the mirror magickal, perform the Drawing Down the Sun magick ritual. You just need to be cautious when you do this – don’t look into the mirror until the ritual is complete, keep your eyes averted, don’t have any flammables near you (such as dry leaves or paper) and make absolutely sure that no one else is present. Once you’ve got these safety measures in place, take a small mirror and hold it in your hand. Tilt it slightly to catch some sunlight for about 9 seconds (no more than that). Once that’s done, reserve your magick mirror for magickal purposes only when a certain spell calls for the Sun Energy. Traditional devotional art flourished in the Middle Ages when the Christian church dominated all over Europe and revered paintings, made for the church, God and the saints. In Wicca, the two main deities are manifestations of God and the Goddess, and devotional or mystical art is a way to encounter them on a different level, as well as letting your subconscious come out and play. Devotional or mystical art is a devotion to the deity – but it is more than that. Through the act of creating a piece of mystical art, the artist or the witch is able to access the divine creative energy, the life force or Source that exists in everything that’s alive. By doing this, the artist becomes a drop in that vast stream of life, and co-creates with the divine. Rather than the technique or the medium used, colours are very important in mystical art. Pick bold and energetic colours that speak to you and don’t be afraid to splash them all over canvas – whatever you feel your subconscious is telling you to do. While there are many expressions of devotional or mystical art, real magick is created when you forget about the outcome and simply let the colours and paints lead the way. When it comes to artistic expression, you want to engage that part of you that is normally suppressed – your wild fire, your passion, even the animal nature within you. Suppressing feelings is never a good idea, but sometimes the demands of work or family leave us without any other choice – indeed, sometimes feelings need to be pushed aside, so we can carry on with a certain task at hand. Practicing mystical or devotional art is a different ball-game entirely. You want to undo the process now – so you need to lure out the parts of you that are normally suppressed. 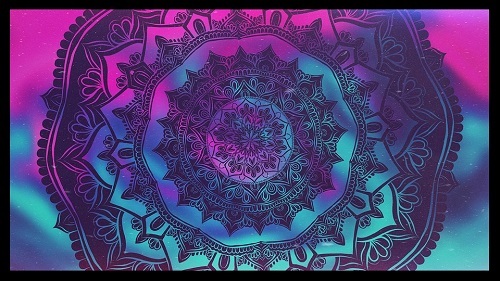 So before you start painting or even choosing your tools, it’s a good idea to put together a mystical music playlist for yourself that you can use to dance and get into the mood. 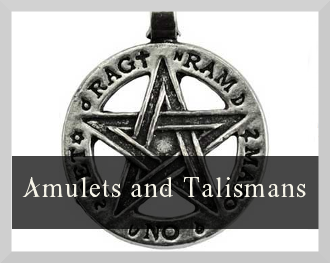 While both are considered to be Wiccan ritual supplies, there are some distinct differences between an amulet and a talisman. While an amulet can be any object you choose, it’s usually rather small in size, so that it can easily fit inside a pocket or a purse. This is because it’s intended to bring good luck and protection to its owner, and thus is often carried around by them. A talisman is very similar to an amulet, but with some distinct differences. While a talisman also possesses magickal powers, they generally have a greater magnitude, can transmit energy to the owner and are often used for very specific purposes. Your amulet can be any object, but traditionally people use special gems, crystals or stones that they’ve picked up on the beach, coins, diagrams, plants, rings or even words written on scraps of paper. If you choose a gemstone or a crystal as your amulet, be sure to read about the different qualities of each gemstone (eg. amber guards against evil spirits, emerald strengthens memory while lapis lazuli helps with insomnia and melancholy moods). Talismans are a bit more complex – engraved figures with magickal symbols or inscriptions are often used as talismans. 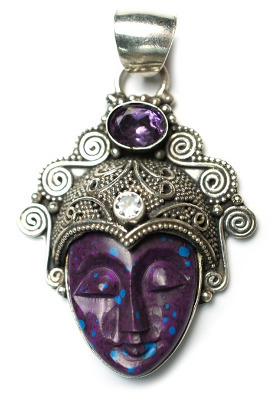 As opposed to amulets, talismans are not generally worn but carried around in a pocket or inside a purse. They can also be kept near a specific objects that a talisman is supposed to benefit. For example, a talisman could be tucked over a child’s bed to guard against nightmares. The magick of a talisman is considered powerful enough, but they can also increase the strength of a spell. When choosing or designing your talisman, pay attention to the magickal properties of different shapes and symbols. For instance, the shape of a black cat signals good luck, while a fish shape symbolises a large family. A piece of an oak is a lucky symbol, and the shape of a pig enhances fertility. Certain letters or numbers can also give off powerful energy vibes, so read up about the magickal properties of specific combinations of letters and numbers before choosing your talisman. 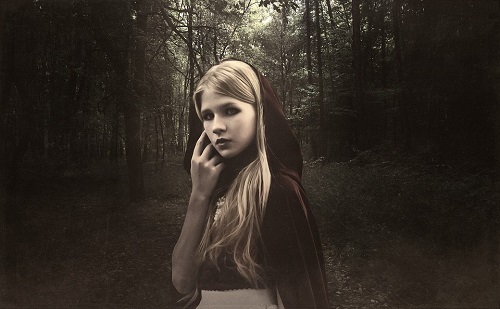 Traditional Wicca and magick practices often require some form of ritual clothing. Not everyone sees the benefits of wearing ritual robes, since the essence of magick emerges in its practice and has little to do with appearances. However, before you dismiss ritual robes, take a look at some of the reasons for wearing them. Cleansing your energy – throughout the day we soak up vibes from the people around us, and often all kinds of energy get stuck in our clothing. It’s not always negative energy by the way – but it can still jar with the energy or purity we wish to invoke during a specific magick ritual. This is where magickal robes can become quite useful as they will have a minimal amount of energy, if you only wear them during magick rituals. Charging your robes – you can also perform magick with a specific intent to charge your ritual robes during a ceremony. This way you’ll end up with a powerfully charged magickal item that you can use for a specific intent or to enhance your magick. Getting yourself in the mood for magick – a simple advantage of wearing ritual clothing is that it can help you get your head out of your daily struggles and thinking about everyday tasks. Putting on a ritual robe may be just the ticket you need to zone out of your routine, engage the mystic that dwells within you and start your magick practice. There’s a lot of supply out there, when it comes to ritual robes and clothing, so here are a few pointers to consider when choosing the right set of ritual clothes for you. Consider the colour of the ritual robes. In magick, different colours symbolise different elements and choosing the right colours can enhance certain ceremonies or spells. Black robes are often associated with ritual clothing in popular media, and correspond with releasing and banishing negativity, repelling black magick attacks, giving you grounding and wisdom, and stimulating learning. Ritual robes with gold in them can stimulate the divine masculine within you, help increase luck, prosperity, abundance and health. Red is another popular choice when it comes to choosing your ritual clothing. Red is associated with the fire element and stimulates courage, sexual potency, independence, assertiveness and vitality, among other things. White is a classic colour that’s used in ritual magick robes. It’s an all purpose colour, and promotes unity, cleansing, restores peace and balance and enhances spirituality and healing. Music can make your spirit fly, or grip you in a passionate dance, sparking that wild fire within you. Music can help you get out of your head and forget yourself in a dizzying dance. Using music in magick can help you evoke a certain mood or awaken a certain, wild part within you. While some people prefer to practice their magick in silence, music can greatly assist and enhance your spells. There’s an entire science called Cymatics dedicated to studying sound vibrations, and the physical effect these can have on the people and the environment. So music is more than just beautiful sounds to get you in the mood – there is a real, tangible effect to the sound vibrations that you listen to, and it can be a very powerful supplement to a spell or ritual. The great thing about using music is that it’s so varied. Music in magick can help you get in the right mood of clarity and balance, or it can transcend you into a shamanic realm, as well as open and close your ritual. 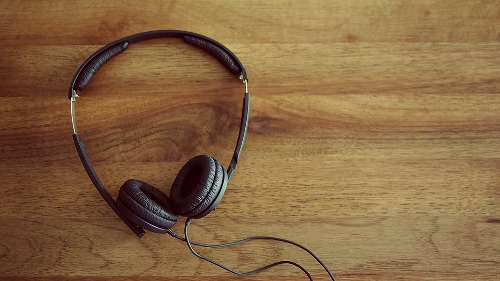 With Youtube at our fingertips, it’s easier than ever to find music that matches the mood of your magick practice. Here’s a summary of the most popular types of music in magick rituals and how they can help you enhance your spellwork. An important part of any magick ritual is getting yourself in the mood – physically, mentally and spiritually. Meditating before a magick ritual is a good idea as it helps to balance your emotions and clear your mind of any unwanted thoughts. From that space of clarity, things seem a lot clearer and the channel is open for the divine to speak to you. While beneficial, meditation can be hard, so meditation music can help enhance the process and help focus your mind better. While guided meditations are not for everyone, they can help to gain access to deeper and deeper levels of consciousness during your meditation practice. There’s a whole range of guided meditations out there – from creative visualisation, to emotional healing, to chakra balancing – there’s a guided meditation for every mood and every occasion. For example, if you’re planning on performing a magick ritual focused on abundance and prosperity, it may be a good idea to perform some guided creative visualisation meditations as part of the ritual. Listening to pagan music before or during your magick practice can help stimulate your imagination and free up your creative capacities, allowing you to imagine yourself as a witch or warlock from times gone past, and transform you into another reality, ready for spell work. Shamanic music is great for getting you out of your head and engaging with your animalistic, passionate core. If you’re performing spellwork that’s focused on emotional healing, shamanic music can help you get your body moving to release any suppressed emotions through other means than just your mind. This can be incredibly liberating, and can help you clear your mind for deep meditation afterwards. The Divine communicates in symbolism, so wearing symbolic Wiccan or Pagan Jewellery every day, or choosing to wear it during your magick rituals can be a powerful way to enhance your spells and keep the divine communication channel clear for receiving messages. Symbolic jewellery also offers us a great way of self-expression. 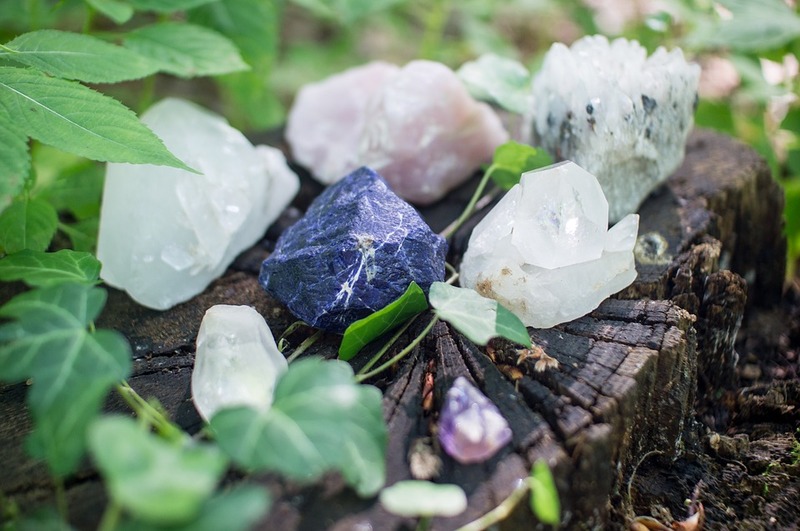 When used in ritual magick, the combination of gemstones, precious metals and natural materials can help conduct and focus certain types of energy into particular spells, enhancing their effect. From purchasing special magickal jewellery to making your own, there’s a range of options available out there. To help you choose the right Wiccan or Pagan Jewellery for you, here’s a list of pointers to consider. There’s a range of traditional symbols, associated with Wicca. Each represents a specific meaning and can help you recognize other Wiccans when you wear that type of jewellery. It’s a good idea to familiarise yourself with each symbol and research its specific meaning, before committing to wearing one of them. The most common symbols include pentacles, stars, a crescent moon, the symbol of the Goddess, the Triple Moon, spirals, runes and Celtic designs. Choosing the right materials for your sacred jewellery is also very important, as you need to wear materials that agree with you, and rest comfortably against your skin. What’s more, each material possesses certain magic powers or energies. A typical necklace or bracelet will be made from a mix of metals, gemstones, symbols and some natural materials. Again, try researching the properties of each material before you put your jewellery kit together. For example, jewellery made of copper can help to enhance the type of masculine energy we receive from the Sun, giving us courage and deflecting threats. However, jewellery made of silver can make us more susceptible to our own feelings and to those of the people around us. There are certain energy centers in your body. Chakras is one example of this – certain points in the body that link to the spiritual and energetic field. You can activate these Power Centers by wearing your sacred jewellery over these points. Here are a few examples of important Power Centers in the body, and how jewellery can help stimulate them. A circlet or a metal band worn around your head can help stimulate ‘the third eye’. A necklace can help stimulate the heart centre, bringing a certain type of energy or intention to it. Anklets can also serve to remind us that every step we take is sacred. Many cultures around the globe, including the Native Americans and Australian Aboriginals carried a medicine bag or pouch with them. Medicine pouches are typically tiny sacks that you can fill with magically charged items and herbs, and carry either in your pocket or keep somewhere close at night. This way, they become your go-to tool for healing yourself and others. Once you put your medicine bag together, it becomes alive with energy. To maintain its magical force, you’ll need to recharge the items within it on a regular basis or ‘feed it’ with magical items and herbs. Assembling your medicine pouch can be a fun and creative activity, and highly personal to you. Here are some things to consider when choosing your medicine pouch. Medicine bags come in all shapes and sizes, and you can use pretty much any material to create yours. A piece of flannel, linen, felt or even a simple handkerchief are all good options. You may prefer using materials that feel airy, so that the herbs inside your medicine pouch can evaporate a lovely fragrance. Consider the colour, too – green is perfect for prosperity spells, while gold will enhance abundance, and orange will enhance success. 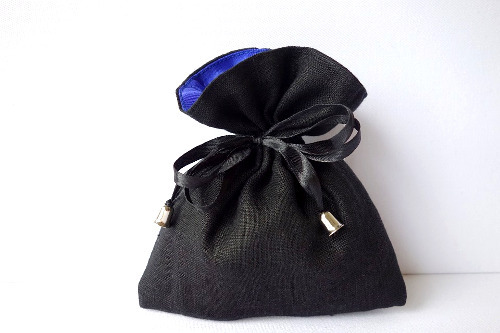 Your medicine bag can contain any number of magically charged items, such as gemstones, pendants, talismans, feathers, shells, coins, rocks etc. It’s important to know the intent for your medicine pouch, and then choose items that match that intent. You can use any number of herbs for your medicine pouch, or you can grind them down into a magic powder. Consider using sweetgrass, sage, cedar, lavender or pinion for their magical and healing properties. See the section on herbs for how to choose your herbal supplies. A witch’s altar can contain a number of small and fragile items, so an altar box or a special storage box can come in very handy in keeping things in order. These boxes come in all shapes and sizes, and can be as plain or elaborate as you like them to be. Some witches like to be on the move, so an altar box is a great piece of kit if you’re travelling but don’t want to leave your precious herbs, gemstones or altar items behind you. 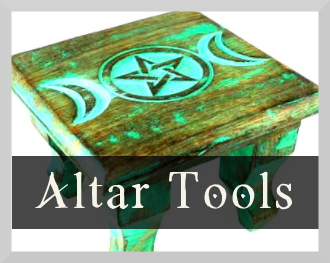 There are some things to consider to help you choose an altar box – but don’t let these practical aspects take away the joy of choosing or making your own altar box! Are you planning on being away a lot of the time, perhaps travelling or moving home? Then a more sturdy wooden box may be the perfect option for you, so as to avoid any precious altar items from getting damaged in the process. Avoid metal boxes if you plan to travel, as these may be trickier to get through airport detectors and customs. If you plan to stick around your place for a while, then you can opt for other materials, such as cardboard or metal. You can also decorate your box in any way you wish, and this can be a fun and creative project! Are you planning to fill your altar box with gemstones? Or do you have a range of candles that you use in candle magick, or perhaps some vials of potions? Do you wish to keep larger items, such as a cauldron or a God or Goddess statue separate? Then having two boxes may be a better option. There’s a range of altar boxes out there, some with tiny pockets or marked compartments, so consider how many items you’ll place inside. 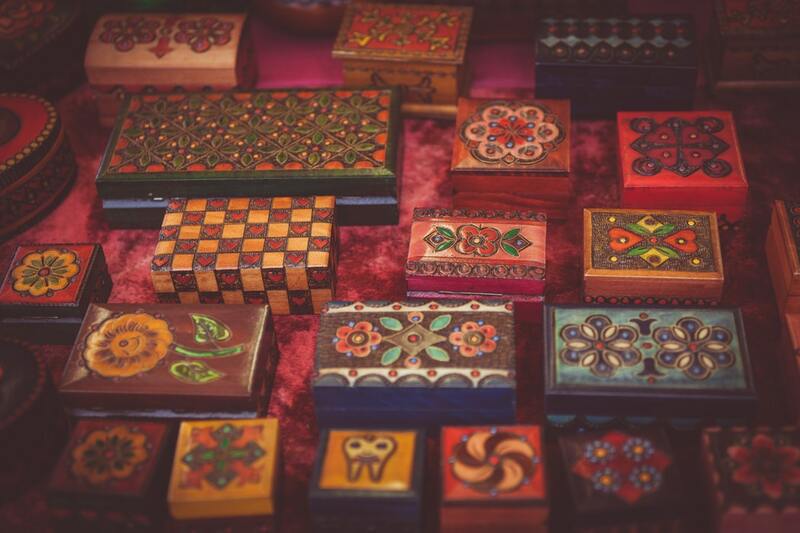 You may also choose to build your own box, or enhance an existing box with your own compartments – this way you can adjust the box according to your needs, as your magick practice grows and develops. We hope you’ve found this list of Wiccan supplies informative and comprehensive!